Although these have flexibility of width., these are not what I expected. The upright does not fit well into the wire shelving. The uprights are wobbly. I had expected something with a bottom. The bottom is the surface of my closet shelving. I am sorry I got them, because they do not meet my need. Please do not waste your time and money on this. Mine broke hooking it too the shelf the first time. Poor quality. I really need to buy more! These are absolutely wonderful. I don't know what I did without them. My closet shelves were a mess! I used them to organize my t-shirts and my purses! Now I can find everything! Next project: my husband's side of the closet! I really need this product but could find the stuff that would be used on solid wood shelves. Thank goodness you came to my rescue! Flexible and adaptable. Good construction and quality. Neat as a pin pantry! I used these to organize all the different categories of canned and boxed foods in my Pantry which has wire shelves (i.e. cereals/soups/rice/ potatoes/cake mixes/baking supplies...etc.) and now when I look in there, it's so much easier to see what I want and the whole Pantry looks neat as a pin. The dividers are nicely snug and don't fall over. My husband, who finds my organizing amusing, actually likes these and said they were a great idea! No more "visual clutter!" A long closet shelf gets messy & clothes get wrinkled. Boxes/drawers provided no way to see what clothes were there. With the divider, clothes stack neatly, and if the stack tumbles as she grabs something, it's just that area to straighten, not the whole shelf. Great organizer good for adults too. These dividers are great. I purchased the dividers for wire shelves and now everything stays were I put it making a lot more room for more items. This is what the product looks like. I live in an apartment which has the same closet shelf as pictured. 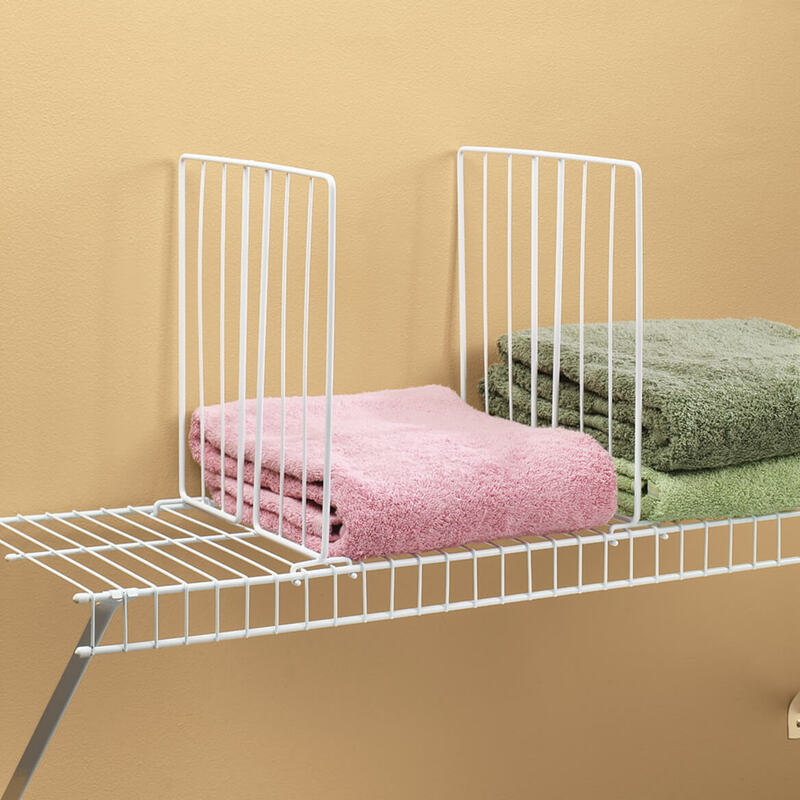 The wire closet shelf dividers work well and I glad to purchase the set of these 4 dividers. Just take a good look at the photo and make sure you have the same wire shelf! What a fantastic item! I couldn't find any dividers for wire shelving until Miles Kimball came along. These are fantastic! I would definitely recommend these to a friend! These are easily installed and will help you organize your clothing so that you can see it easily. I organized my tees by color. Clothes I had forgotten I had were found, organized, and now get worn. These are great for closet shelf dividing. I was able to organize Tee shirts according to color so that I can locate any top in a jiffy. The tees are stacked neatly and the dividers hold a large pile of tees, shorts, or whatever. These shelf dividers are just what I needed. I keep my sweaters and purses on the top shelf in my closet and they stay separated this way instead of falling over into the next stack. I am very satisfied with these dividers. I've used these dividers to organize my tee shirts, sweatshirts and sweaters. They work great! The dividers didn't exactly fit the wire shelf but by adjusting the ends I was able to get them to work, so I'm satisfied with the purchase. I read other's comments before making this purchase. Some were disappointed because they didn't fit as they were supposed to. 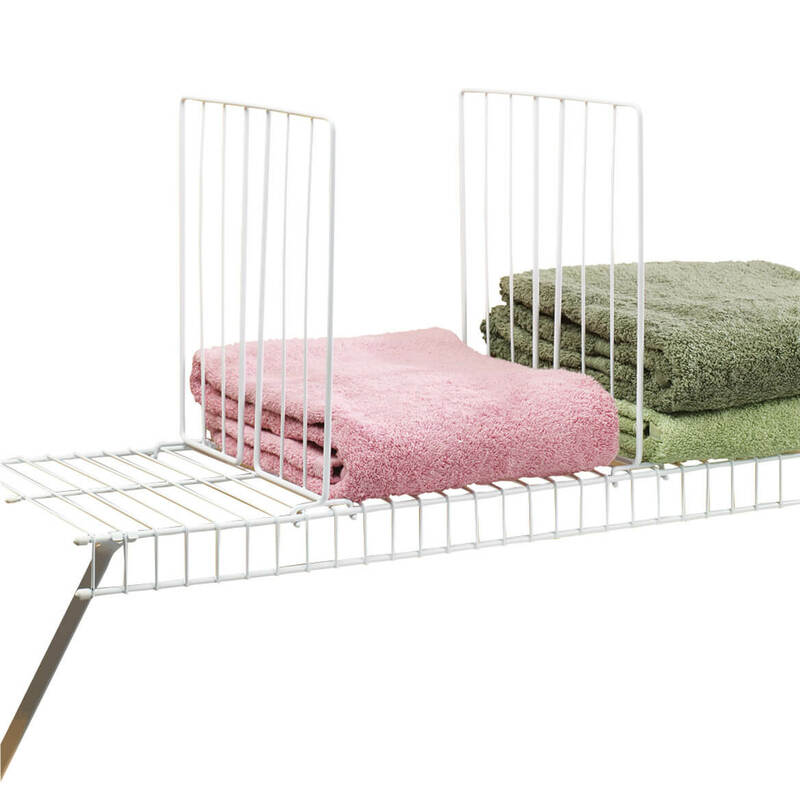 Mine didn't either, but I used a wire bread tie to fasten the shelf in the back and it works fine in my linen closet to separate stacks of towels on the top shelf. I'm glad I purchased them. I sent it to my daughter, she liked it. I needed something to separate my handbags on the top shelf of my closet. These worked well. My handbags that stand up do not fall over in my closet. No more handbags falling on my head. Works like a dream. I now have more room on the top shelf of my closet. It is a good idea, but try as I could, could not get them to fit. It wasn't what I expected as I felt they would be more firm between each other. I am using them on a shelf above my clothes. They do keep items in one place and that is what I wanted. Good, useful product, but costs too much for only four panels. Six would be a better value at that price..
can not find in stores.. have been looking for a while. ideal for neatness. Needed for organization of many T-shirts. The shelf dividers are wonderful, they keep my sweaters organized, otherwise, they become a messed up jumble. I have had them in my other homes and love them! For more storage in my closet. I like things to be neat. To separate my purses in my personal closet and towel in the linen closet! Divide my shelf for purse storage. Worked great! Will help to organize closet shelves. My sweaters on the closet shelf keep slipping over. I'm hoping this will do the trick. I have been unable to find appropriate dividers for my wire closet shelves. Good product, good price ! Getting ready to finish up Spring cleaning. Closets next. I have wire closet shelves, and I need dividers to organize the space more efficiently. I hope they work. Debated ordering. Catalog I order from Valentine 2017 stated price was $13.99.I am being charged $15.99. I hope they will help keep items neat on shelves. looking to eliminate tossed items to a controlled stack. They are sturdy, easy to install and overall great product. I tried a set of these dividers and they are very good for getting my t shirts into neat stacks. I still have two more shelves to go. Really organizes items to make them easier to select when needed. Although I am a little nervous about the posted reviews, this is exactly what I need and not available in Lowes or Home Depot. I was looking for something to help organize my linen closet and this item works perfectly. I had been looking for something to help organize my closet and when I saw this shelf divider, I hope this would serve the purpose. I had never seen one like this before. BEST ANSWER: I am not sure I understand what you are asking.The dividers are as deep as the metal shelving, are approximately 10" high, and can be placed anywhere on your metal shelf you want. A set of four creates three divided spaces. So-so -- they don't stand-up on their own as I'd thought they should, no matter how I tried to adjust them but they're useable -- perhaps the ones for the wooden shelves would have fit more tightly. How long is the bottom rack holding the dividers? divider for use with a wooden shelf? BEST ANSWER: This shelf dividers work very well with wire shelves. I believe that is what they were made to used. they have a hook like apparatus on bottom which may hook on wood. I didn't try them on a flat surface. Thank you for your question. These Wire Closet Shelf Dividers are made for wire shelves. The dividers for wooden shelves are 314012. We hope this information will be of help to you. I don't think so. It attaches by hooking on to the existing wire units. How do these work with a wooden shelf? BEST ANSWER: These would not work on a wooden shelf but there are others available that are made to use with wooden shelves. Does the shelfs come with the hardware? can these be used on freezer shelves?